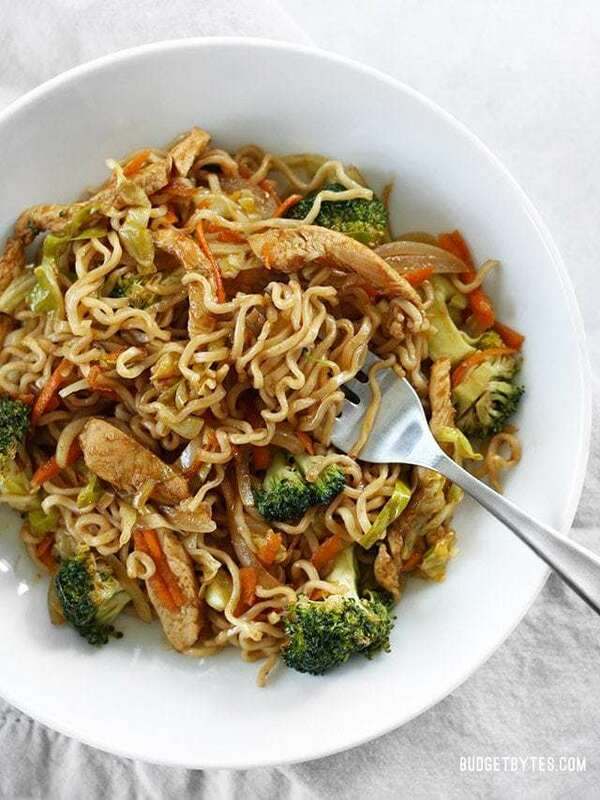 If you’re used to the usual sweet-salty flavor of teriyaki sauce that is so common in most Asian-inspired American food, this yakisoba sauce may catch you off guard. The addition of ketchup makes this sauce super tangy, and a splash of Worcestershire gives it a deeper umami flavor and a very different sort of sweetness. I used a whole tablespoon of sriracha in my sauce because I really like my food spicy, but feel free to reduce that to 1/2 tablespoon or even a teaspoon if you want the sauce a bit more tame. 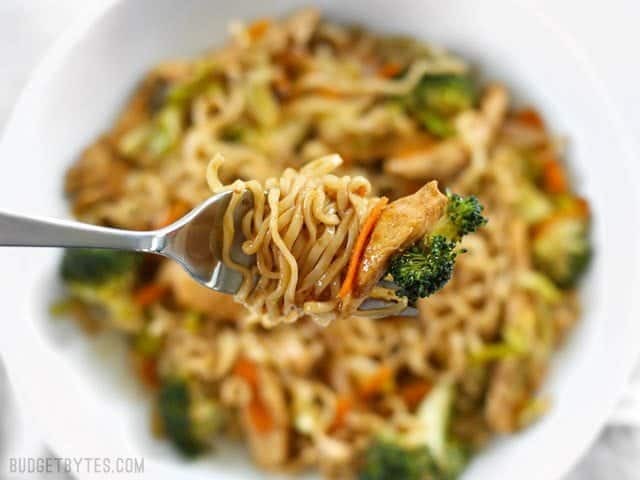 Skip take out and make these easy and addictive Chicken Yakisoba noodles that are full of chicken and vegetables, and drenched in a sweet and tangy sauce! 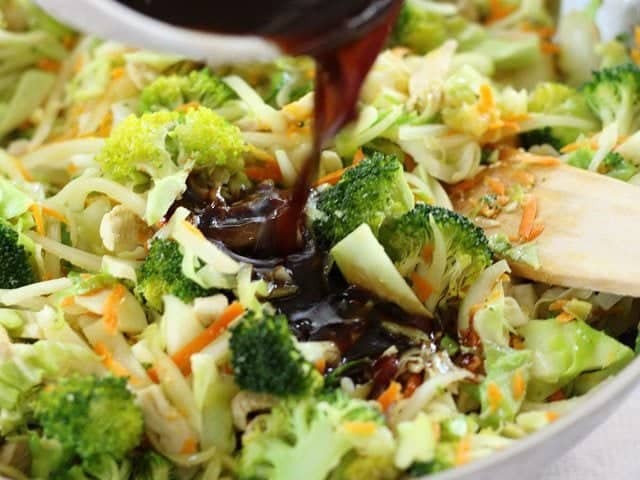 In a small bowl, combine the soy sauce, worcestershire sauce, ketchup, sriracha, and sugar. Use only 1/2 tsp of sriracha if you don’t want it spicy, use up to 1 Tbsp if you like it hot. Stir until the ketchup and sugar are dissolved. Pour the sauce into the skillet with the chicken and vegetables with the heat still on medium high. Add the noodles, stir to coat everything in the sauce, and heat through (just a few minutes). 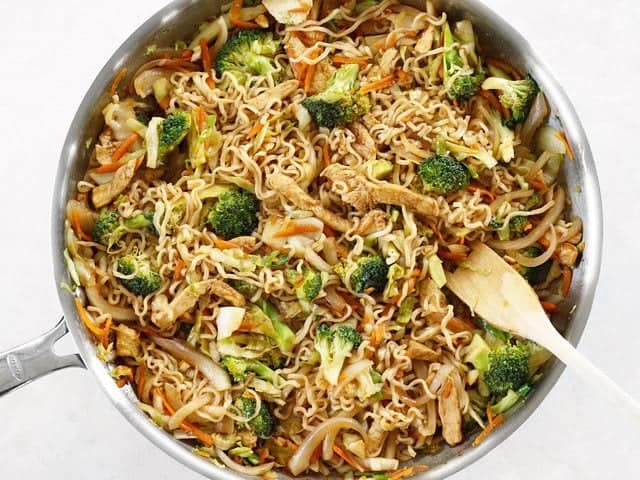 Want more ways to dress up your ramen noodles? 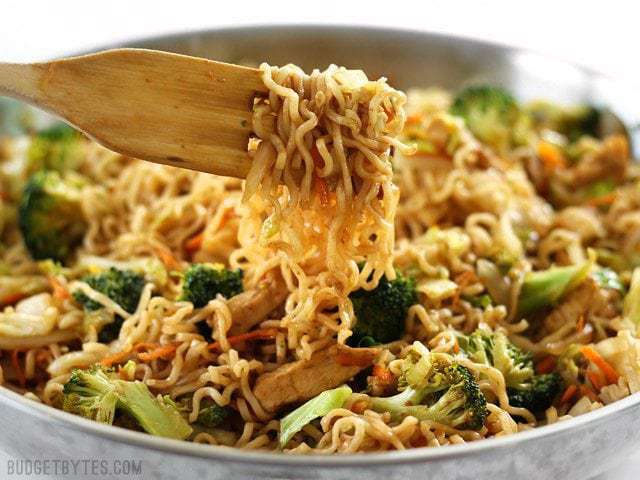 Check out 6 Ways to Upgrade Instant Ramen, Vegetable Stir Fry with Noodles, Lime Shrimp Dragon Noodles, or Pork and Peanut Dragon Noodles. 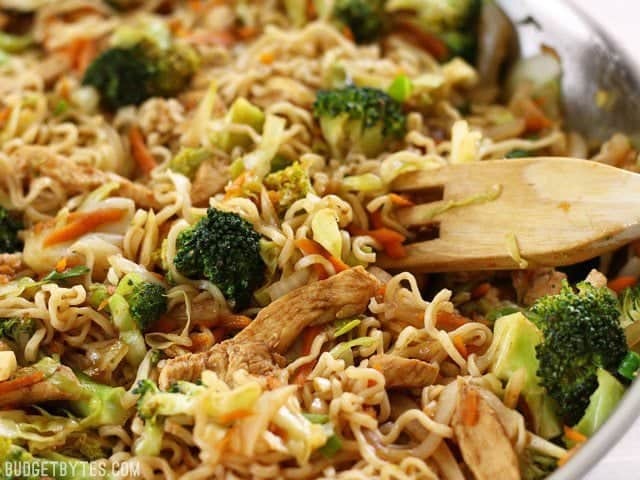 Prepare the Yakisoba sauce first, so that it’s ready to go when you need it. 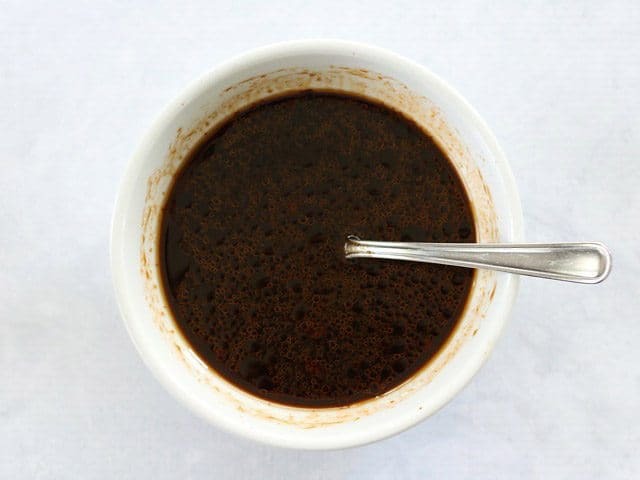 In a medium bowl, stir together 1/4 cup soy sauce, 1/4 cup Worcestershire sauce, 2 Tbsp ketchup, 1 Tbsp sriracha, 1 Tbsp sugar, and 1 tsp toasted sesame oil. This is the “toasted” sesame oil. It doesn’t always say “toasted on the bottle, but you can tell this is the toasted variety because of the deep brown color and because it’s sold in a tiny bottle. 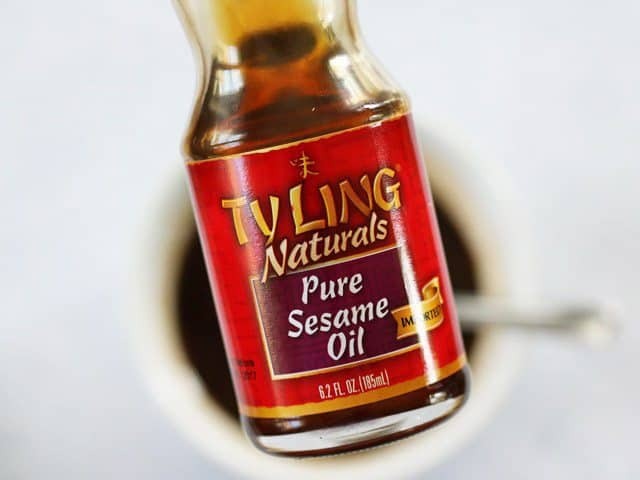 Toasted sesame oil has a much stronger nutty flavor and only a small amount is needed for a big impact. Next, slice up your vegetables. Thinly slice one yellow onion and 1/2 a small head of green cabbage. Use a large-holed cheese grater to grate 1-2 carrots. Cut one crown of broccoli into small, bite-sized florets. Slice one chicken breast (about 3/4 lb.) into very thin strips. I like to do about 1/4-1/2 inch wide and about 2 inches long. Grate about one inch of fresh ginger. 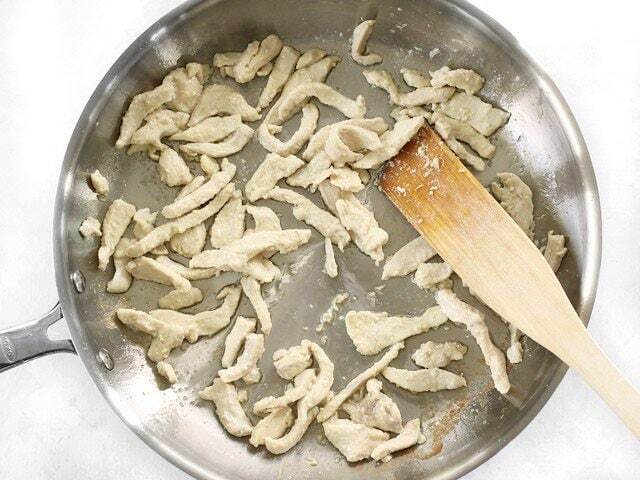 Heat a very large skillet (at least 12″ diameter) over medium heat, then add 2 Tbsp vegetable oil. Tilt the skillet to distribute the oil, then add the grated ginger. 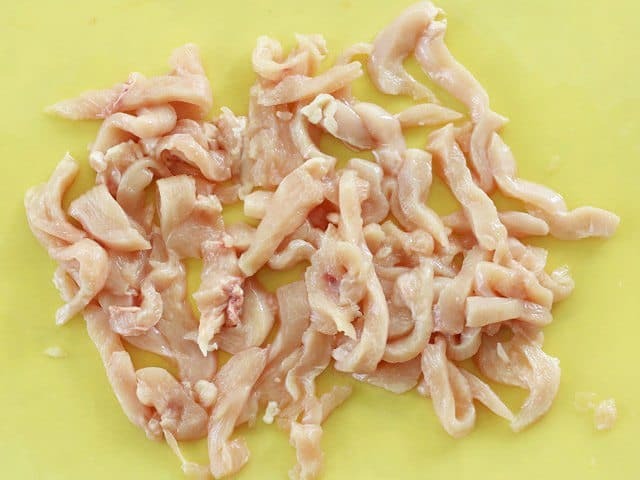 Sauté briefly (about 30 seconds), then add the sliced chicken and continue to cook until the chicken pieces are cooked through. 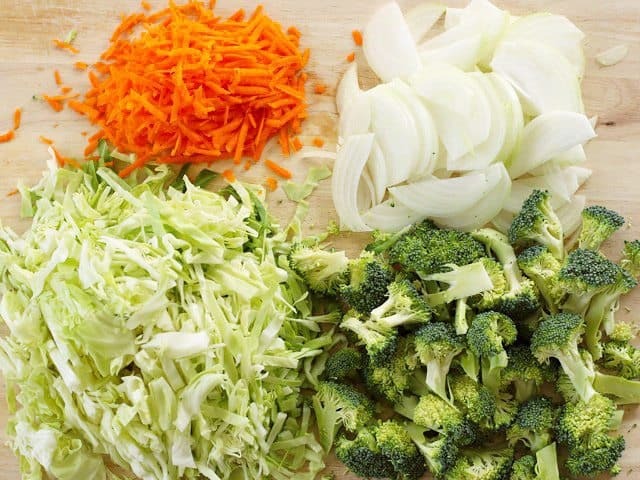 Add the sliced vegetables and continue to sauté until they are slightly wilted, but still bright in color. Meanwhile, boil a pot of water and cook two 3oz. 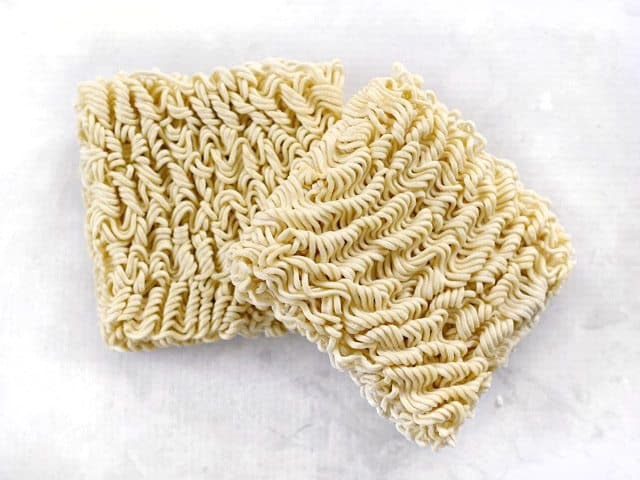 bricks of ramen noodles until tender, then drain in a colander. Finally, pour the prepared yakisoba sauce onto the vegetables and stir to combine. 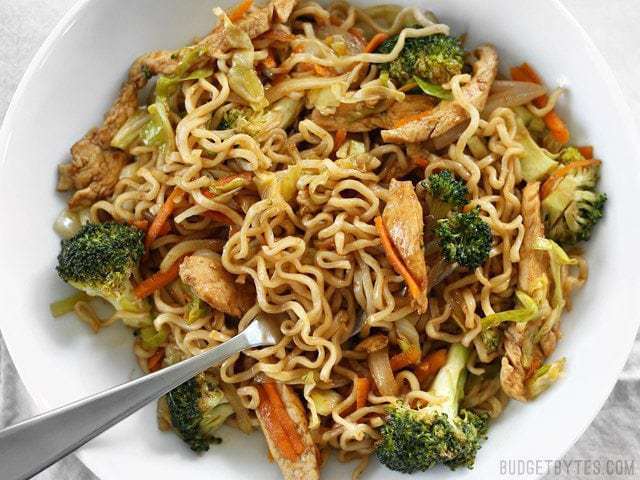 Then add your cooked and drained ramen and stir until everything is combined and coated in the sauce. THE END. Easy, right? Sweet, tangy, and a little spicy. And VERY noodley. 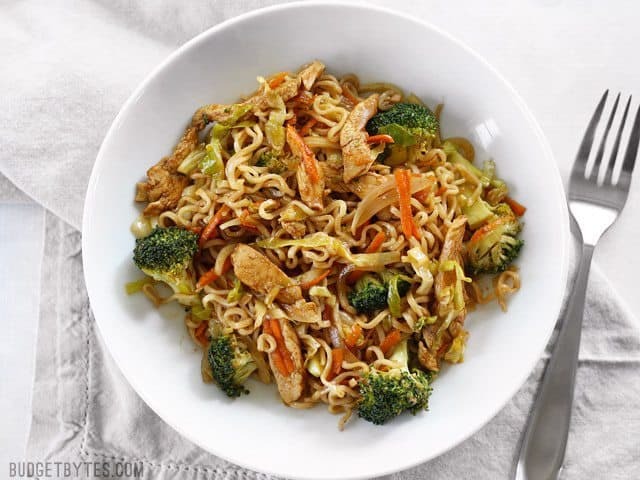 ;) Chicken Yakisoba all day, every day! So yummy and so simple. I used broccoli slaw and it worked out great! Ate it all week long and making it again. Used purple cabbage and more chicken. Keeper. I bought a bottle of sesame oil, per the list of ingredients. When I read through the instructions you had a picture of toasted sesame oil, which I always have. I made the recipe with toasted sesame oil and it was fun and lively. I substituted bok choy for the cabbage. This is a delicious recipe! I crave ramen a lot these days and your additions makes it somewhat healthy! Going into my repeat recipe folder. This turned out really good! I added cabbage and mixed vegetables. Yummy! HORRIBLE! This is the equivalent of boiling pasta, covering it with spam & ketchup & calling it “Italian food”. I should have trusted my instincts when an Asian dish called for non Asian ingredients (ketchup?! Worcestershire sauce??!) Sadly, I trusted the reviews who have clearly been written by someone who’s version of quality Asian food is 2min noodle packets & I’ve wasted a whole dinner. The sauce really ruined it. The recipie base is fine but use kecap manis sauce or any actually Asian sauce instead. Very good. Did not put in cabbage for dietary reasons, and used gluten free rice Ramen noodles. My husband loved it and had seconds. Will certainly be making it again. I LOVE this. I made it last Sunday night and had it for dinner, then lunch for the whole week and I’m already dreaming about making it again. 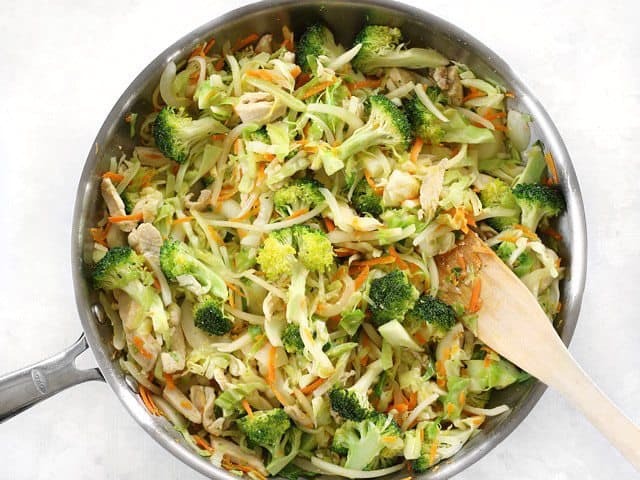 I used a bag of prepared stir fry veggies and a bag of broccoli slaw because I am lazy, and a little less than a teaspoon of sriracha because I am a wimp. I might bump that up just a bit next time but otherwise wouldn’t change a thing.